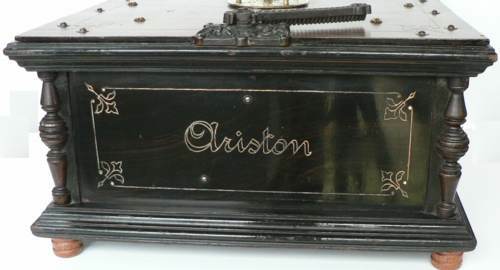 The Ariston here is a 24 note machine with interchangeable music titles in the form of perforated hard cardboard disks with a diameter of 33 cm was the most successful table barrel organ. Due to the much more affordable price it offered many the first opportunity to own a small music player for use at home. Several hundred thousand "Aristons" were made between 1882 and about 1904 and the disk catalogue included more than 5000 different song titles. There are several variations, some have simple gold patterns others are printed with old paintings but all 24 note instruments are approximately 40 x 40 x 25 cm. The invention of the punched tape control weaving looms 1801 by the Frenchman, Joseph Marie Jacquard to automatically produce complex patterns was not only the foundation for today's computer technology, but also for the operation of automatic music machines. 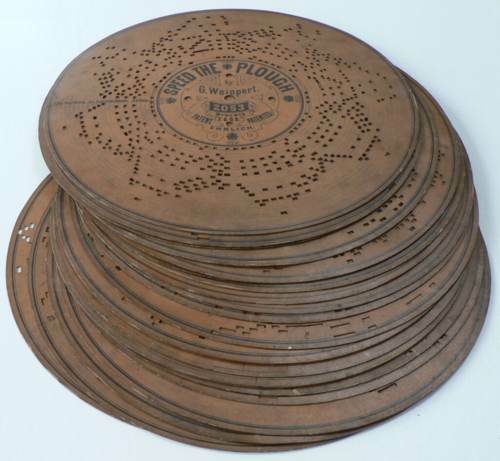 The first patent for a punched tape controlled musical instrument was in 1847. 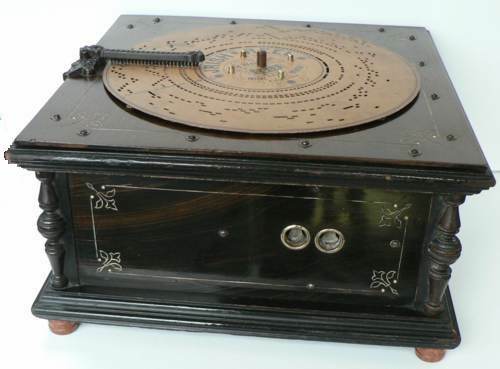 In the last quarter of the 19th century this principle saw the birth of a flourishing industry in the production of mechanical musical instruments. With this development, Leipzig, in particular the area called Gohlis, became the world capital for the production of mechanical musical instruments. The most important and far largest producer for almost two decades distributing its products all over the world was founded by Ernst Paul Ehrlich (b1849 -1925) in Leipzig. By profession he was a musical instrument maker. 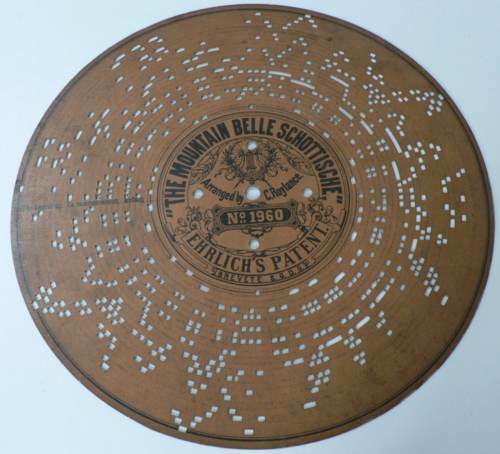 His patent of 1876 in for an instrument using punched tape which he marketed as the "Orchestrionette" and in 1882 the "Ariston" which used perforated cardboard discs (patent 277766). These instruments used compressed air from a bellows to vibrate steel reeds (similar to those in a harmonica). Levers operated by the holes in the tape or disc divert air to the appropriate reeds. The drive was made by a hand crank, which operated the bellows and moved the punched tape and/or the perforated disk. The instrument was easy and straightforward to use and tunes could be readily changed. 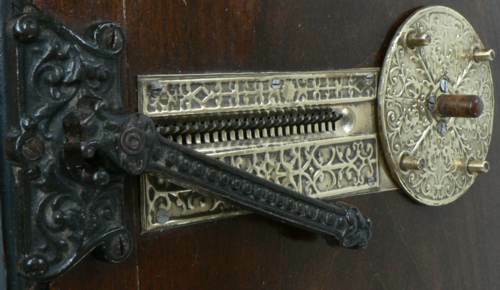 This was the main advantage of these instruments over the cylinder type with raised pins which were common at this time (often of Swiss manufacture).